If you have had a cellar door experience that you would love to share with us and your fellow winery loving community, be it at one of the 350+ cellar doors we have reviewed to date or any other cellar doors that you have visited around the world, please feel free to add your own comments and ratings in the comments boxes on each of our pages. We would truly love to hear what you have to say! The cellar doors in the area tend to be smaller, more family run offerings, providing for a great personal experience as well as offering a number of different dining options. The area is also extremely popular with cyclists and whilst surrounded by mountains, the bike tracks between a number of cellar doors in the area are actually quite flat, making it a great region to explore on bike. Congratulations to Feathertop Winery who received a "2 Door" award, Ringer Reef who received a "1 Door" award and Billy Button who received a "Hidden Gem" award. Central Otago is an informal name for the inland part of the Otago region in the South Island of New Zealand. The area commonly known as Central Otago includes both the Central Otago District and the Queenstown Lakes District to its west. The Central Otago District, which is the world's southern-most commercial wine growing region, is made up of a few different sub areas and is home to around 80 wineries. The region is most famous for its production of Burgundy-style grapes, producing some world renowned Pinot-Noir. Outside of Pinot Noir the region produces Chardonnay, Sauvignon Blanc, Riesling, Pinot Gris, and Gewürztraminer. Sparkling wine is made in the traditional style from Pinot Noir and Chardonnay grapes. There are a vast range of cellar door experiences in the area, but most still tend to be smaller, family run operations offering a more personalised tasting experience. One thing that stands out in this region are the views, with many of the cellar doors having amazing views of the magnificent backdrops of mountains, vines and lakes. A number of the cellar doors also offer dining options ranging from highly regarded restaurants to more casual food platters. Outside of wine, there really is something for everyone in this region. Amazing ski fields situated within a short drive, beautiful and varied dining options, sensational vistas, a variety of hiking/walking tracks and for those a little more adventurous there are a multitude of adrenalin activities on offer. When in the region we tend to stay in Queenstown which makes for a good base. While many of the wineries are a 30-45 min drive from here, they tend to be in clusters, so you can take a few day trips and cover off on a few at a time, leaving the ones closer to Queenstown for a shorter trip. We really do enjoy coming to this area and if you haven't been, it is one of those places that really should be added to you must-do list! Congratulations to Misha's Vineyard, Mount Edward and Wooing Tree Vineyard who each received a "Hidden Gem" award and to Amisfield and Wet Jacket who's ratings were upgraded. Situated in the heart of Victoria's oldest wine region, the Yarra Valley, Levantine Hill is certainly setting the standard for winery offerings in the region. Set amongst the vineyards in a stunning building designed by renowned architect Karl Fender, Levantine Hill offers an amazing range of wine tasting and dining options with a team that is outwardly passionate and proud of the product they are offering. The cellar door tasting options range from a more casual seated tasting of five of their wines in a modern, yet elegant tasting space, through to their ultra-premium tasting of ten wines in the barrel style booths that look out over the expansive grounds and vineyards beyond. While the wines speak for themselves, the team will be more than happy to guide you through a tasting of the range, which is quite extensive and includes varietals such as Pinot Noir, Chardonnay, Shiraz, Cabernet Sauvignon and Sauvignon Blanc, to name a few, and provide you with some great history on the wines and winery, including the Family Vineyard wines, where each block is named in honour of a family member and from which only premium wines in impeccable years will be bottled. There are also two dining options on offer, including signature hatted restaurant, Ezard at Levantine Hill. Both dining options are housed within the same amazing building as the cellar door and with high vaulted ceilings, polished concrete floors, wood and black steel accents and floor to ceiling windows, this is a very chic and modern setting that makes the most of the amazing surrounds. The food on offer ranges from a range of share plates in the more casual all day dining space through to an eight course degustation with matching wines in the signature restaurant. While we are yet to try the more casual dining option, the eight course degustation was a taste sensation with it's combination of superb, carefully prepared produce, creative flavours and beautiful presentation. ​Each course was matched perfectly with the wines and the service was friendly, professional and attentive. Just over an hour northeast of the Melbourne CBD by car (or Helicopters can be accommodated if you are in a rush! ), Levantine Hill offers a superb day out in the Yarra Valley and if you enjoy amazing wine, food and hospitality we highly recommend a visit if you ever get the opportunity. ​Congratulations ​Levantine Hill for providing a superb cellar door offering and receiving our "2 door" award. Part of the wider Central Victorian zone, the Strathbogie Ranges wine region is home to over 25 vineyards which produce a range of varietals including Chardonnay, Pinot Noir, Sauvignon Blanc and Shiraz. Situated 1.0-1.5hrs from Melbourne, it is easily accessible from Melbourne and if you've ever driven along the main highway between Melbourne and Sydney, you will have passed through the region including right by one of the main cellar doors of the region, Fowles Wines. With a great mix of farms, vineyards and forests, this is quite picturesque region to visit and there are a number of smaller and larger towns to explore including Seymour, home to the relatively new cellar door, Wine by Sam. The nearby region of Nagambie lakes is also a very picturesque region to visit with its blend of bush settings, vineyards, rivers and lakes. There are plenty of outdoor activities to get involved in, including taking a trip on the Goulburn Explorer, a riverboat that runs between the Nagambie township, Mitchelton winery and Tahbilk winery. With both Mitchelton and Tahbilk offering fantastic dining options as well as Mitchelton now offering a beautiful accommodation option, including day spa, this is a fabulous spot to get away for a few days. We have been to the region numerous times and always enjoy our visits here, so if you are looking for a great, relaxing weekend away from Melbourne, definitely add the Central Victoria region to the list. The Wairarapa wine region is in the south of New Zealand's North Island, only an hours drive north of Wellington. While a relatively small region, producing only around 1% of New Zealand's wine, the area offers a great range of styles and varieties including Pinot Noir, Sauvignon Blanc, Chardonnay and Syrah. The region’s vineyards tend to be planted on high alluvial terraces in deep stony and free draining soils and with a long growing season (budburst in early September, veraison in February and harvest in late March through to end of April), low rainfall (600- 700mm (24in) a year), high sunshine hours (summer conditions have a peak of approx. 32°C (92°F) and cool nights (10°C (50°F) on average), offer great conditions for the beautiful Pinot Noir that is a focus of many in the region. There are three main sub-regions in the area; Martinborough, Gladstone and Masterton and on both of our visits, we have chosen to stay in the town of Martinborough, which is within short walking distance of most wineries in the region. Cycling between wineries is also very popular with a bicycle hire shop in town. You can even arrange to have your purchases transferred back to your accommodation so you don't have to ride around with them all day! The cellar doors in the region tend to be smaller boutique operations which make for some great personal experiences whereby you will often be dealing directly with the owners and/or winemakers who will be more than happy to take you through their range of wines. There are also has some fantastic dining options in the area, including at a number of the cellar doors. Other attractions in the area that we found interesting were the Putangirau Pinnacles (signage in the park was a little lacking and we got a bit lost, but quite spectacular to look at once you find them!) and the Cape Palliser lighthouse and seal colony, where the seals are literally just laying on the side of the road. We also explored Greytown, which is another nice town in the region. This is a compact region that is extremely easy to get around and packs a big punch in terms of food and wine offerings and we have thoroughly enjoyed both of our stays in this area. Congratulations ​to Tirohana Estate and Margrain Vineyard who both received a "1 door" award and Cambridge Road and Martinborough Vineyard who both received our "hidden gem" award. Refer to our Wairarapa page for further information, including detailed reviews and ratings of individual cellar doors visited on both this, and prior, occasions, including previous "2 Door" award winner Mission Estate. Congratulations ​to Craggy Range and Elephant Hill who's "2 door" awards were both reaffirmed (with Craggy Ranges overall score increasing to 18.5/20 subsequent to their recent refurbishment and enhancement of offerings), Black Barn Vineyards who's "1 door" award was reaffirmed and Askerne who received a "1 door" award. Refer to our Hawkes Bay page for further information, including detailed reviews and ratings of individual cellar doors visited on both this, and prior, occasions, including previous "2 Door" award winner Mission Estate. Congratulations to Codorniu who received a "2 door" award and Cava Guilera who received our "hidden gem" award. Refer to our Penedes page for further information, including detailed reviews and ratings of individual cellar doors visited. Located in northern Spain, at the foot of the Pyrenees Mountains, Somontano has been a Spanish Designation of Origin (DO) since 1984. The principal wine town is Barbastro, with most of the 15 or so wineries located in the surrounding countryside. The production area of the Somontano Designation of Origin is made up of three different zones: the ranges, the Somontano itself, and the plains. Its total area covers over 200,000 hectares, of which 100,000 are cultivated, and over 4,400 hectares of these with vineyards. Grapes belonging to the DO include traditional local varieties, such as Moristell and Parraleta as well as other Spanish and foreign varieties including Tempranillo, Cabernet Sauvignon, Chardonnay and Gewürztraminer. The Ruta del Vino (Wine Route) of Somontano is one of the 13 official wine routes recognised by the Spanish government and is a very useful tool when visiting the area. While in Somontano, it is worth leaving some time to drive around the surrounding areas and take in the beautiful vineyard views with backdrops of mountains and historical architecture, including the stunning village of Alquézar. With documentation of significant wine production in this area dating back to the 2nd century BC, there is certainly a wealth of wine history in this region and, now coupled with some very modern wineries and large architecturally designed cellar doors, there are a great range of experiences to be had in this region. Congratulations to Laus and Vinas Del Vero who both received a "1 door" award. Refer to our Somontano page for further information, including detailed reviews and ratings of individual cellar doors visited. Jerez, located in South Western Spain, is known as the city of sherry, flamenco, horses and motorcycles and in 2013 was the European Capital of Wine. All Sherry Wines come from the Sherry triangle; a protected region in the south of Spain embracing Jerez de la Frontera, Sanlucar de Barrameda and El Puerto de Santa Maria. There are 3 basic grape types; Palomino grapes, Pedro Ximenez and Moscatel. Palomino grapes are harvested fresh and pressed almost immediately. Pedro Ximenez and Moscatel are left outside in the sun for up to a week, effectively turning them into raisins with a higher relative sweetness. Each Sherry needs to spend at least an average of 3 years in barrel, with VOS (Very Old Sherry) spending 20+ years and VORS (Very Old Rare Sherry) spending 30+ years. The entire process from harvest (which is regulated and is therefore always done in the last week of August and first week of September) to bottle, therefore takes at least 4 years. Jerez itself is a beautiful town with a number of spectacular cathedrals and churches as well as a range of fantastic dining options. There are a number of Bodegas within an easy walk of town, making Jerez the perfect base for exploring all things Sherry! It's fair to say we had not had much experience with Sherry before visiting here, but we certainly found this an extremely informative and interesting region to visit and we would definitely love to visit this area again. Congratulations to Bodegas Fundador who received a "1 door" award and Bodegas Tradicion who received our "Hidden Gem" award. Refer to our Jerez page for further information, including detailed reviews and ratings of individual cellar doors visited. Douro is a Portuguese wine region centred along the Douro River. The region became an official appellation in 1756 and has Portugal's highest wine classification as a Denominação de Origem Controlada (DOC). While the region is associated primarily with Port wine production, the Douro produces just as much table wine (non-fortified wines) as it does fortified wine. The non-fortified wines are typically referred to as "Douro wines". The region itself is divided into three sub-regions: from west to east the Baixo Corgo, Cima Corgo and Douro Superior. The fertile, cooler, rainier Baixo Corgo, is the sub region with the most vineyards. The Cima Corgo, including the towns of Pinhão, São João da Pesqueira and Tua, is the heartland of fine port production, also the source of many of today’s fine unfortified wines. The Douro Superior, very cold in winter, extremely hot in summer, is the biggest of the sub-regions, and while not all planted, there is much more planting underway. The visually spectacular terraced vineyards are very common in the Douro region. Vineyards dedicated to Port production are usually planted on schist while areas with granite-based soils are used for table wine production. The areas around Peso da Regua, including Pinhao, are home to some of the most spectacular winery landscapes we have ever come across. There are a large number of wineries (or Quinta’s) to visit in this area, many of which have absolutely stunning views, lovely restaurants, fantastic accommodation and, of course, fabulous wines. There are also a number of great cellar door and dining options in the villages themselves, making for a great mix of winery based and urban experiences. Also, if you love sparkling wines, then definitely add the area around Lamego to your itinerary, which has a great history and sparkling wine culture. Porto, home to the majority of port cellaring, is the second largest city in Portugal and is a beautiful city with some fabulous architecture, amazing dining options and fantastic wineries. We had a great casual dinner on the waterfront at "Bacalhau", a lovely winery based lunch at Vinum at Graham's overlooking Porto and amazing fine dining experiences at Palco and DOP (which also has a sister restaurant in the Douro valley that is highly rated, DOC). Most of the Port Lodges are in the area of Villa Nova Gaia, just across the river from the city and are mostly located within a short walking distance of each other, making it possible to visit a few of them on the same day. You can also take Port boat rides here, with a number of operators offering tours. An amazing part of the world and definitely one that every wine lover should add to their bucket list! Congratulations to Quinta do Seixo, Quinta do Bomfim, Quinta Nova, Quinta do Tedo and Graham's who each received a "1 Door" award and Casa de Santo Antonio Britiande, Cockburn's, Ramos Pinto and Vasques de Carvalho, who each received our "hidden gem" award. Refer to our Douro page for further information, including detailed reviews and ratings of individual cellar doors visited. Ribeira Sacra and Ribeiro are Spanish Denominations of Origin (DO) for wines located in the north and northwest of the province of Ourense, in Galicia, Spain. Winemaking in this area dates back to Roman times, and was continued by monks during the Middle Ages. The landscape of the region is spectacular, covered in beautiful terraced vineyards, however with inclines of 45-60 degrees (and reaching up to 85 degrees), it is not possible to mechanise the vineyard activities, such as pruning and harvesting. While these gradients therefore make for very hard work, they are also important for protecting the vines against frost bite, which a number of non-terraced vineyards in the area have been affected by this year. Ribeira Sacra specializes in the production of dry red wines from the Mencia grape, with other preferred red varieties being Brancellao and Merenzao. There are also a range of white wines produced, with the most important white-wine varieties being Godello (Verdelho), Treixadura and Albarino. Ribeiro, on the other hand, is mostly known for its white wines. The principal grape varieties are Treixadura, Torrontes, Godello, Loureiro and Albarino, with white wines accounting for around 85 percent of all wines produced in the DO, perfect for pairing with the amazing seafood from the Galician region! There are a number of fantastic wineries in these regions, a number with restaurants and many have views that you have to see to believe. An amazingly beautiful region that is definitely worth adding to your bucket list! Refer to our Ribeira Sacra and Ribeiro page for further information, including detailed reviews and ratings of individual cellar doors visited. Congratulations to Martin Codax and Pazo Senorans who each received a "1 Door" award. Refer to our Rias Baixas page for further information, including detailed reviews and ratings of individual cellar doors visited. Rioja is a famous wine region in the north-central part of Spain and is best known for producing the well-known and loved red wine, Rioja. Rioja is a blend of the indigenous grape of Spain, Tempranillo, along with other fruity additions like Garancha, Mazuelo and Graciano. The denomination of origin spreads along 54,000 hectares around three different Communities (La Rioja, Basque Country and Navarre). Our first stop was in Elciego, part of the Basque Country community. In this region you will find breathtaking landscapes, an amazing blend of traditional and modern architecture, fantastic restaurants and hotels, some of which are built on wineries, mountainous backdrops and an endless sea of vineyards! Be sure to stop off at the "balcony" picnic spot, which has an amazing view out over the entire region. When planning winery visits in the region, it is important to book in advance, particularly if you would like an English speaking guide. There are numerous food offerings in the region, however, we had dinner at both the formal and less formal restaurants at Marques de Riscal and had lunch at Baigori. Each meal was fantastic. Our second stop was in Haro, part of the La Rioja community. Boasting the highest concentration of centuries old wineries in the world, the Station District in Haro is a wine lover's paradise. With so many of La Rioja's best wineries within a stones throw of each other, a day spent tasting wine is easy to organise. Haro is not large, and it is possible to walk to most of the wineries. If you just want to do a tasting of the wines, appointments are not necessary and while you will be required to pay, a tasting of a few wines should not cost more than €5-10, although many offer an option to book a tour and/or premium wine tasting. We did note in this area in particular, that the opening hours posted on the gates often differed to those on the wineries website, with the times posted on the gates appearing to be the more accurate. As such, we suggest taking a quick wander around the Station District when you arrive and take photos of the opening hours before you make your plans! A great region, amazing wines, fabulous surrounds, beautiful food and definitely a mist visit for wine lovers! Congratulations to Bodegas Baigorri who received a "2 door" award, Ramon Bilbao and Marqués de Riscal who each received a "1 Door" award and Bodegas Valdelana who received our "hidden gem" award. Refer to our Rioja page for further information, including detailed reviews and ratings of individual cellar doors visited. One of the foremost wine regions in the world and home to 5 first growth premiere cru's including Chateau Mouton-Rothschild, Chateau Lafite-Rothschild and Chateau Latour. There is definitely a long and interesting wine history in this region and certainly alot to learn here, with five Bordeaux wine classifications, with each classification having sub-classifications, different rules and regulations, unique labelling, opportunities for reclassification and a whole lot more!! There are also a number of different appellations within the region, with different terroir, sub-climates, winemaking techniques and philosophies all of which produces an amazing variety of wines, with Bordeaux being the largest AOC vineyard of France. The city of Bordeaux itself is the centre of the region and is a beautiful city with magnificent architecture situated on the banks of the Garonne river. Must visits when in the city are the botanic gardens and the farmers markets, where you can try their famous canelé cakes (a caramalised crust cake in the shape of a mould). These cakes were actually created as a by product of the wine industry, in that they were developed to use the egg yolks left over from the whites that were used for fining the wine. The other local delicacy that you have to try at the market is freshly shucked oysters and wine. ​There are also a number of beautiful villages within Bordeaux, including St Emilion, home to beautiful wine and macaroons, Pauillac, home to some of the most famous Chateaux in Bordeaux and Labarde, home to one of our favourite little restaurants in the region, La Gare Gourmande. This is definitely one of the most beautiful wine regions we have been to in the world and all of the tours we have done have been a little bit different, making for a very enjoyable and educational experience. Be sure to allow some time to just drive/wander around and take in the amazing architecture and history of this region, which is spectacularly beautiful and somewhere I suspect we will be returning to again and again! Congratulations to Château Lamothe Bergeron, Château Siran and Château Giscours who each received a "1 door" award. Refer to our Bordeaux page for detailed reviews and ratings of individual cellar doors visited on this, and previous, trips. The Bendigo wine region, located in Central Victoria, is just two hours from Melbourne, making it a perfect spot for a weekend visit. Whilst primarily renowned for its Shiraz and Cabernet Sauvignon, the region offers quite a range of varietals, including some fabulous whites. The cellar doors in the region tend to be smaller in size, often meaning that you will be hosted by either one or more members of the family and/or winemaking team. This makes for not only a very informative experience, but a much more personal and interactive experience. We do note that as many of these working wineries are family run, a large number are only generally open on weekends, so be sure to plan your trip accordingly. One thing that we did notice in this region compared to many others is that a number of the cellar doors showcase the same wine across a number of vintages, enabling you to get a sense of the impact of different weather conditions and cellaring potential of the wines. We personally think this is a fabulous way to help visitors understand and appreciate the wines. There are a number of great dining options in the region, both at a number of the wineries and in Bendigo itself. We had great lunches at both Balgownie Estate Winery and at Masons of Bendigo and if you do visit Masons, we highly recommend doing the "Roaming Menu", whereby the chef selects a number of dishes for you to showcase the best of what is on offer. Not only was every dish beautifully prepared and presented, but we thought that it was sensational value for the quality of food and service. Congratulations to Balgownie Estate Bendigo and Sandhurst Ridge who each received a "1 door" award and Killiecrankie who received our "Hidden Gem" award. Refer to our Bendigo Region page for detailed reviews and ratings of individual cellar doors visited. The Mornington Peninsula is a beautiful area, with vistas over either Western Port Bay or Port Phillip Bay from different points along the ridge, plenty of beautiful native bushland and streets lined with old mature pine trees. Mornington Peninsula produces cool climate wines and is particularly known for Pinot and Chardonnay. However we did notice from our discussions with the many cellar door teams that there are a significant number of micro climates that make for very varied wines, as well as production of some great wines that aren't necessarily traditionally considered a cool climate wine. With the region being so close to Melbourne (and fairly compact, with only about a 15 minute drive between the most distant cellar door locations) it is really geared towards weekend visitors and, as such, we found that a little extra planning was required to find the cellar doors that are open during the week. Also, while there are a number of cellar doors in close proximity of each other, there are no real walking tracks and therefore some form of transport will generally still be required for your visits. The region is also home to some brilliant food options ranging from farmgates to highly regarded cheese factory's to 2 hatted fine dining restaurants (and everything in between!). We thoroughly enjoyed each of our dining experiences during our latest visit to the region, including at The Long Table, Port Philip Estate, Polperro and Rare Hare. Congratulations to Stonier, Willow Creek Vineyard, Yabby Lake and Morning Sun who each received our "1 Door" award, joining the regions three previous award recipients. Refer to our Mornington Peninsula Page for detailed reviews and ratings of individual cellar doors visited on this, and previous, trips. The Yarra Valley is Victoria's oldest wine region with the first vines being planted in 1838. Just over an hour northeast of the Melbourne CBD, the Yarra Valley is a very beautiful area with it's flowing hills and valleys and is a popular weekend day drip from Melbourne. The Yarra Valley is recognised as one of Australia's chief cool climate producing regions and is famous for it's Chardonnay, Pinot Noir and Sparkling wines. However, with over eighty cellar doors in the region, there are a significant number of styles and varietals to taste. Many of the region's wineries have cellar doors offering wine sales and picnic facilities, with some of them also featuring restaurants, cafes and boutique accommodation. On our most recent visit we had a beautiful lunch at Meletos, which also has some great views over the vines and valley. The region is also home to a number of great restaurants, cheese factories, fruit farms and breweries and once you are done eating and drinking, the Yarra Valley has a number of other attractions and activities including bush walking trails, markets, galleries and the famous Healesville Sanctuary. We always enjoy or visits to this region and look forward to heading back. Congratulations to Oakridge, Yering Station and Chandon who each received our "1 Door" award, joining the regions five previous award recipients. Refer to our Yarra Valley page for detailed reviews and ratings of individual cellar doors visited. The Coal River Valley region is just 20 minutes from Hobart and has a good cross section of cellar doors ranging from a number of small family run establishments to one of the larger wine company's in Tasmania, Frogmore Creek. Southern Tasmania's climate produces wines more like those of Europe than mainland Australia, with some amazing quality of both reds and whites on offer. We generally base ourselves in Hobart to explore this area. Located at the entrance to the Derwent River and set amongst the foothills of Mt Wellington, Hobart is a great city with a nice blend of historical buildings and modern conveniences. There are plenty of accommodation options here, a number of nice restaurants and plenty to see and do. Take a walk along the iconic waterfront (be sure to pop by the many fishmongers and fish and chip shops and keep an eye out for the local sea lion! ), explore Salamanca (including the fantastic Saturday outdoor market) or take a trip across to MONA for an interesting art experience. We always thoroughly enjoy or visits to this region and look forward to heading back. 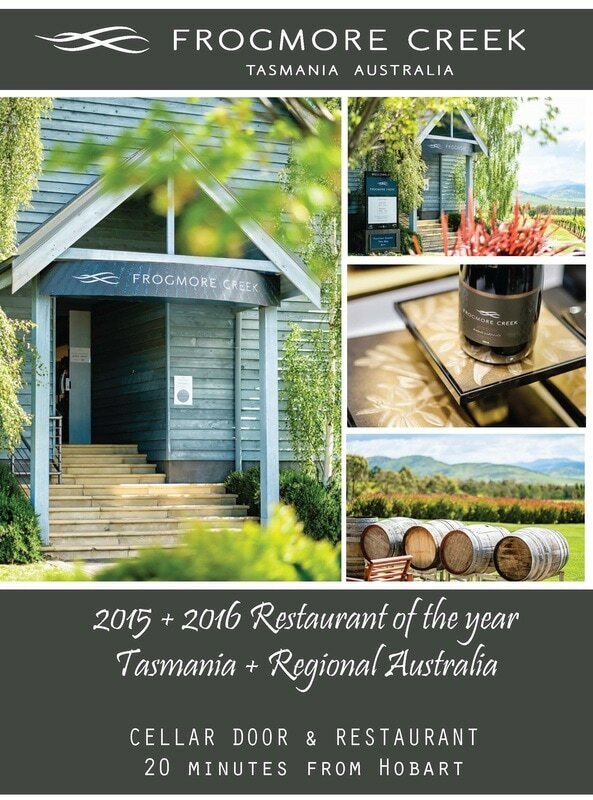 Congratulations to Riversdale Estate and ﻿Bangor Wine and Oyster Shed﻿ who both received our "1 Door" award, joining the regions previous "2 Door" award recipient, Frogmore Creek. Refer to our Coal River Valley and Southern Tasmania pages for detailed reviews and ratings of individual cellar doors visited. Tasmania's Derwent Valley region is just 20 minutes drive from Hobart. Although possibly now more well known for MONA (Museum of Old and New Art), which is also home to Moorilla Estate, the Derwent Valley is home to a small, but select, number of cellar doors. Being a cool climate region, there is some beautiful Pinot Noir and Chardonnay produced, as well as a number of other cool climate varietals. When looking to visit to the cellar doors in this area, it is important to note that most of the limited number of cellar doors are closed on Tuesday and Wednesday, so make sure you factor this into your planning. We generally base ourselves in Hobart to explore this area. Located at the entrance to the Derwent River and set amongst the foothills of Mt Wellington, Hobart is a great city with a nice blend of historical buildings and modern conveniences. There are plenty of accommodation options here, a number of nice restaurants and plenty to see and do. Take a walk along the iconic waterfront (be sure to pop by the many fishmongers and fish and chip shops and keep an eye out for the local sea lion! ), explore Salamanca (including the fantastic Saturday outdoor market) or take a trip across to MONA for an interesting art experience. If you are really motivated, a trip up to Mount Wellington is well worth it, but be sure to pack numerous layers of clothing if you are visiting in Winter! Congratulations to Moorilla who received a "2 door" award and Stefano Lubiana who received a "1 Door" award. Refer to our Derwent Valley page for detailed reviews and ratings of individual cellar doors visited. The Coonawarra wine region is around 4 hours drive from Adelaide and 5 hours drive from Melbourne. The region, with its layers of red soil on limestone base, is best known for its red wines, particularly its Cabernet Sauvignon, but also produces a nice variety of other wines including Shiraz, Chardonnay, Riesling and Sauvignon Blanc. As a region to visit, it is particularly easy to get around to each of the cellar doors, even on foot if you are inspired! The cellar doors are located along a 22 kilometre stretch and situated either side of the Riddoch Highway, making it very easy to navigate your way. It is also a very picturesque walk/drive with vines scattered either side of the highway as far as the eye can see. We have now visited the region on 3 different occasions and note that if you stay at the north end of town, just before the stretch of cellar doors begins, you are able to walk up one side of the highway (as far as you would like), stopping at each of your chosen cellar doors and then walk back along the other side, again stopping wherever you like (we do note, however, that at this stage there is no defined walking path between the cellar doors, so it is a matter of walking along the side of the highway to do this). All of the cellar doors we visited were also more than happy to hold our purchases until the next day, when we went back with our car to collect! There are also some great places to eat in the region and lunch at Hollick was lovely, with a great outlook over the vineyard, Ottelia does some great wood fired pizzas and share plates and one of the restaurants in town, "Pipers" was a particularly delicious experience. A number of the cellar doors also offer picnic supplies and/or allow you to bring a picnic and enjoy the surrounds. The Coonawarra Vignerons Association also has a great winery map on their website which also seemed to be available at most of the cellar doors we visited. We really enjoy the family feel to this region and also note that it is probably one of the most child friendly regions we have visited, with most cellar doors having indoor/outdoor toys and play areas that seemed to be a hit with kids. With it's picturesque setting, nice accommodation options, great eateries and welcoming residents, it's certainly a great place to visit. Congratulations to Rymill, Balnaves of Coonawarra, and Wynns Coonawarra Estate who each received a "1 Door" award, joining previous "1 Door" award recipient Katnook Estate, and Koonara who received a "Hidden Gem" award. Refer to our Coonawarra page for detailed reviews and ratings of individual cellar doors visited. Our focus on this trip was around the Bellarine, where there are some fantastic cellar doors of all shapes and sizes. Many of the cellar doors also offer various dining options and we had great meals at each of the wineries we ate at, which on this trip were Terindah Estate, Shadowfax, Basils Farm and Jack Rabbit. Congratulations to Terindah Estate, Oakdene, Shadowfax and Basils Farm who each received a "1 Door" award. Refer to our Geelong page for detailed reviews and ratings of individual cellar doors visited. The Heathcote wine region, approximately one and a half hours north of Melbourne, is situated in the heart of Central Victoria and nestled beneath the stunning McHarg and McIvor Ranges. Home to over 30 cellar doors, the region is renowned for its Shiraz, but also produces a number of other red varietals including Sangiovese, Tempranillo, Petit Verdot, Cabernet Sauvignon and Merlot as well as some excellent Riesling and Viogner. The cellar doors tend to be smaller, family run operations, making for a more intimate experience and the opportunity to learn a great deal about the wines, the family’s histories and the region itself. There have been quite a few new and improved additions to the cellar doors in the area over the past ten years and there appears to be much more on the cards for a number of the cellar doors, including some new and enhanced food offerings which would be a great addition to the region. With the cellar doors being in relatively close proximity of each other and with each having a good, but not extensive, number of wines on tasting, it is possible to visit quite a few wineries in the course of a day trip. However, if you feel like spending a bit more time in the region and enjoying some of the other activities on offer, there are some great new accommodation options available for you to make a weekend (or longer) of it! Congratulations to Merindoc who received a "1 Door" award and Silver Spoon Estate who received a "Hidden Gem" award. Refer to our Heathcote page for detailed reviews and ratings of individual cellar doors visited. Many of the region's wineries have cellar doors offering wine sales and picnic facilities, with some of them also featuring restaurants, cafes and boutique accommodation. On our most recent visit we had a beautiful lunch at Mandala wines, which also some great views over the vines and valley. Waiheke Island, also referred to as "the Wine Island" is an approximate 35 min passenger ferry ride (or a little over an hour on the car ferry) from Auckland. The island is home to over 20 cellar doors and offers a surprisingly extensive range of wine varietals. ​The region is historically best known for it's Bordeaux-style blends, but is now increasingly known for its Syrah and Chardonnay, while also offering an extensive range of other varieties of both red and white wines. The cellar doors in the region are very much focussed around enjoying the surrounding views, with many of the tastings able to be done outdoors. Most of the cellar doors also offer you the opportunity to buy wine by the glass so you can sit and enjoy some of the amazing views on offer. Many of the cellar doors also have food offerings, including some very well regarded fine dining restaurants. There are also a number of dining options in the various towns spread around the island. Getting around Waiheke is relatively easy and while the cellar doors are quite spread, there are a number of clusters whereby there are 2 or 3 cellar doors within close proximity of each other, so planning day trips is quite simple. You can also walk between a number of the wineries, if you wanted to leave the car either at home, or in the one spot for the day. Other means of transport on the Island include both an Island Bus and a Wine Bus (Summer Only), where you can hop on and off at various points on the Island. A number of the cellar doors also have helicopter pads, with various helicopter packages available. There are also a number of beautiful beaches as well as very picturesque walking (or tramping) tracks around the Island....a good way to work off some of the delicious food and wine on offer and take in some of the amazing views that Waiheke offers! Congratulations Te Whau Vineyard who received a "Hidden Gem" award. Refer to our Waiheke Island page for detailed reviews and ratings of individual cellar doors visited. Congratulations to Amisfield who received a "1 Door" award and Brennan﻿﻿ and Wet Jacket who each received a "Hidden Gem" award. The Canberra wine district is around half an hours drive from Canberra, ACT and is home to around 30 cellar doors. While the region takes its name from the nation’s capital, most of the cellar doors are actually located in the surrounding districts of NSW. The cellar doors are generally smaller, family run operations, providing a more intimate tasting experience. The district is considered a cool-climate wine area, but covers a large altitudinal range of 300 to 800 metres, with the lower altitude and more inland regions substantially warmer than the higher altitude areas. This enables production of a wide range of wines from Riesling and Chardonnay to Pinot Noir and Shiraz. Canberra itself, which is around 7 hours drive from Melbourne and 3 hours from Sydney, is a great base from which to explore this region. In addition to many well regarded restaurants and eating precincts such as Manuka, Kingston, Lonsdale Street and the new Kingston Waterfront, there are a number of great, generally free, attractions to visit including museums, the High Court, Parliament House and the Australian War memorial. And if you feel up to it, a walk around Lake Burley Griffin is a great way to work off some of that food and wine! Congratulations to Helm Wines and Mount Majura Vineyard﻿﻿ who each received a "Hidden Gem" award. The Orange wine region is around 3.5 hours west of Sydney, NSW. The region is considered a cool climate region and is the highest wine region in Australia, extending from 600m to over 1000m elevation. While Shiraz, Cabernet Sauvignon, Chardonnay and Sauvignon Blanc are the most widely planted varieties in the region, there are a growing number of newer varieties being planted, resulting in a diverse wine offering. The wineries in the Orange region tend to be smaller, family owned wineries and the cellar door experiences therefore often involve the winemaker and/or owners, providing a more personal tasting experience. The 30+ cellar doors in the region are spread around, however the region is quite compact and there are generally pockets of 3-4 cellar doors situated near each other, making it quite convenient for planning visits. Orange itself is quite a nice town with a number of good dining options. We had nice meals at Lolli Redini, Percy’s Bar & Kitchen & Union Bank Wine Bar and Dining. There are also a number of smaller towns in the region and the quaint town of Millthorpe, which is also home to a couple of cellar doors, is worth a trip. Overall, the Orange region offers a nice, more personalised range of cellar door experiences and is well worth a visit if you enjoy great wine. Congratulations to Philip Shaw who received a "1 Door" award and Angullong﻿﻿ who received a "Hidden Gem" award. Refer to our Orange page for detailed reviews and ratings of individual cellar doors visited. The Hunter Valley is just over 2 hours north east of Sydney, which makes it a very popular weekend trip for Sydneysiders. The valley is very picturesque, covered with vines and the beautiful Brokenback ranges in the background gives some fantastic vistas from all areas of the valley. With over 100 wineries in the Hunter Valley, including some very historical names in Australian winemaking, there is a lot of ground to cover and while the region is reasonably compact, there are a few different pockets to explore. Outside of wine, the Hunter Valley is home to some amazing restaurants. While in the area we dined at Muse Restaurant, Muse Kitchen, Circa 1876, Esca & Goldfish Bar & Kitchen. All served great food and had different feels to them, but for us dinner at Muse Restaurant was the standout for the week. Congratulations to Bimbadgen Estate, Hungerford Hill and Margan﻿﻿ who each received a "1 door" rating in recognition of providing a superior cellar door experience and Tempus Two and Usher Tinkler Wines who both received a "Hidden Gem" award. Refer to our Hunter Valley page for detailed reviews and ratings of individual cellar doors visited. Kumeu is a coastal wine village approximately 20 minutes drive from Auckland city. The area is home to around half a dozen cellar doors ranging from boutique winemakers to larger, well known names (although we note that Matua and Nobilo have just closed their cellar doors in this region). The region produces wines from grapes sourced both in the local area as well as other NZ wine regions including Marlborough, Hawke's Bay and Central Otago. Congratulations to Soljans Estate Winery﻿﻿ who received a "1 door" rating in recognition of providing a superior cellar door experience. Refer to our Kumeu page for detailed reviews and ratings of individual cellar doors visited. Congratulations to Cable Bay Vineyards and ﻿﻿Mudbrick Vineyard﻿﻿ who each received a "1 door" rating in recognition of providing a superior cellar door experience and Man O' War who received a "Hidden Gem" award. Refer to our Waiheke page for detailed reviews and ratings of individual cellar doors visited. The Macedon Ranges are approximately an hour north west of Melbourne with the region particularly well known for it's beautiful pinot noir. Home to over 30 wineries, the cellar doors in the region are on the smaller, more personal side and are generally family run businesses, providing a nice contrast to some of Victoria's other wine regions. The region is also home to some interesting non-wine attractions. There is a fantastic view from the top of Mount Macedon and the infamous Hanging Rock is a nice place to visit and take a walk (and maybe take a picnic, if you dare!!!) Note: Entry fee to Hanging Rock is $10 per car. There are also some really nice towns in the region. Kyneton is home to a number of beautiful restaurants, some lovely stores to browse and botanical gardens. A few of our favourite restaurants are Source Dining, La Bonta and Mr Carsissi. Daylesford and Hepburn Springs are home to natural mineral springs and as a result have many day spas offering a wide and varied range of massages and other treatments. The restaurant that the area is most well known for is Lake House, which is housed in a beautiful setting. Kasuki's is another hatted restaurant in the area, where we found the food and service to be exceptional. There are also a number of other quaint little towns in the region which are worth a stop in between wineries! Congratulations to Passing Clouds and Curley Flat who each received a "1 door" rating in recognition of providing a superior cellar door experience and St Anne's Vineyard and Cloud 9 Farm who each received a "Hidden Gem" award. Refer to our Macedon Ranges page for detailed reviews and ratings of individual cellar doors visited. Many of the region's wineries have cellar doors offering wine sales and picnic facilities, with some of them also featuring restaurants, cafes and boutique accommodation. Congratulations to Mandala Wines, Medhurst Wines, Soumah and Tarrawarra Estate who each received a "1 door" rating in recognition of providing a superior cellar door experience. As part of the Yarra Valley trip, we also visited Mansfield and congratulate Delatite Wines on being awarded our "Hidden Gem" award. Refer to our Other Regions page for our review of Delatite Wines. Rutherglen is situated just over three hours northeast of Victoria near the Murray River Border with New South Wales. It's climate and terrain make it a popular spot for campers, boaters and cyclists. Rutherglen is home to over 20 wineries, many of which are family owned and run. The area is most famous for it's Muscat, Topaque and Durif, however there are a number of variety's and styles to try, including some interesting fortified styles. Many of the region's wineries have cellar doors offering some very picturesque picnic facilities, with some of them also featuring restaurants and cafes. The area is quite flat and compact and therefore caters well to cyclists and the Rutherglen Rail trail that travels through wineries and along the banks of the Murray River is a great way to explore the area. There are also a number of cellar doors within walking distance of town, including one in the centre of town. If you like fortified wines, picturesque settings and a relaxed atmosphere then Rutherglen should be high on your list of places to visit! Congratulations to All Saints Estate who received a "2 door" rating, St Leonards who received a "1 door" rating and Pfeiffer Wines, Campbells of Rutherglen and Jones Winery and Vineyard who each received a "Hidden Gem" award. Refer to our Rutherglen page for detailed reviews and ratings of individual cellar doors visited. Congratulations to Innocent Bystander who received a "1 door" rating. There are also a range of great eating options in the area from well known stores such as Milawa Mustards, The Milawa Olive Shop and Milawa Cheese Factory to great casual comfort food and more fine dining experiences at some of the areas cellar doors. Congratulations to Dal Zotto and Sam Miranda who each received a "2 door" rating, Pizzini who received a "1 door" rating and La Cantina for receiving our "hidden gem" award. Refer to our King Valley Page for detailed reviews and ratings of individual cellar doors visited. The region is also home to some brilliant food options ranging from farmgates to highly regarded cheese factory's to 2 hatted fine dining restaurants (and everything in between!). Congratulations to Polperro and Port Phillip Estate who each received a "1 door" rating and to Merricks General Wine Store for receiving our "hidden gem" award.